"It is unlikely that all traces of evidence could be removed but it could be tampered with," one expert said. Chemical weapons inspectors were able to reach a site and take samples from Syria's Douma on Saturday, two weeks after a suspected gas attack there followed by retaliatory strikes by the United States and others against alleged Syrian government chemical facilities. The Organization for the Prohibition of Chemical Weapons, or OPCW, the U.N. body investigating the suspected April 7 attack that activists and aid groups say killed dozens, said a fact-finding mission will send the samples to the Netherlands for analysis. If a chemical weapons attack was carried out, what possible evidence may remain two weeks on could depend on the substances that were used, experts said. "There is no definitive answer as to what they will find, but it does get harder with time," said Daryl G. Kimball, executive director of the Arms Control Association, a nonpartisan research group. "All signs most likely point to chlorine, which is more soluble, so it's possible there may be less evidence in the soil after delay." "It is more difficult with 12 days passing to investigate, which is why Syria made it more difficult to gain access sooner," he said. The U.S. has blood and urine samples that have been tested, and the samples suggested the presence of both chlorine gas and an unnamed nerve agent, two U.S. officials familiar with the intelligence told NBC News in the week after the suspected attack. The team from the OPCW had been delayed in accessing the site. U.S. State Department spokeswoman Heather Nauert last week accused the Syrian government and Russian officials of preventing inspections and working to "sanitize" the locations and remove evidence. But if nerve agents were used, those substances "can stay for a long time," said Dr. Homer Venters, director of programs for Physicians for Human Rights, a U.S. nonprofit advocacy group. He said that when the organization went into Halabja, Iraq, in 1992, years after a suspected chemical weapons attack in 1988, samples still showed evidence of a gas attack on Kurdish villages. "It is unlikely that all traces of evidence could be removed, but it could be tampered with," Venters said. "It is possible to try and sanitize by removing evidence." The suspected chemical weapons attack came as the regime of President Bashar al-Assad looked to press its advantage in Syria’s seven-year civil war. Douma was the final target of the government's sweeping campaign to seize control of the eastern Ghouta suburbs. Militants gave up the town days after the alleged attack, The Associated Press reported. The United States, along with France and Britain, launched airstrikes aimed at suspected chemical weapons facilities in Syria last weekend. Pentagon officials said the strikes "significantly crippled" Assad's ability to deploy chemical weapons. Syria has denied using chemical weapons. Assad's ally Russia, which has military forces in the country, has also challenged the allegations. Russia claimed on April 13 that the suspected chemical weapons attack was staged. The OPCW said last week that a U.N. team sent to evaluate two sites that inspectors hoped to reach withdrew after being confronted by a large crowd at one site and after coming under small arms fire at a second. Russian Foreign Ministry spokeswoman Maria Zakharova said in a statement Saturday that the delays were "unacceptable." 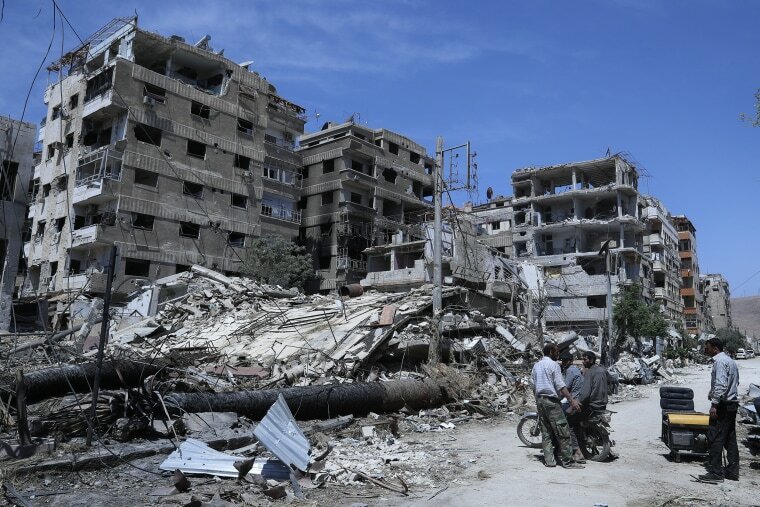 The OPCW said after its team of inspectors visited one site in Douma on Saturday that it will evaluate next steps that could include another trip to the town. Jeanne Guillemin, an expert in bioterrorism and a senior adviser at that Security Studies Program at the Massachusetts Institute of Technology, said Saturday that in addition to soil samples and munitions, the OPCW will look for biomedical evidence from autopsies and hospital records of survivors if possible. "The fact that OPCW continued with its mission tells us the organization's experts still hoped, despite the 12-day delay, that its team could discover some reliable evidence," Guillemin said. More than 500,000 Syrians are estimated to have died in the conflict. The U.,N. human rights office said in 2014 that it would stop officially counting deaths because of the difficulty in obtaining accurate information. Millions of people have been displaced since pro-democracy protests exploded into a full-fledged civil war. Thousands of people — rebels and civilians — left Douma on buses to north Syria in the days after the suspected attack, believing they couldn't live under government authority after it retook the town. The evacuations were the latest in a string of population transfers around the capital that have displaced more than 60,000 people as the government consolidates control again. "The evolving political situation in Douma has complicated the OPCW investigation," Guillemin added. "People are now dependent on the Syrian government, and they may not feel they can talk to foreign investigators without suffering repercussions."